Embracing emotional responses and building resilience. The toughest part of each Forest School session is probably right at the beginning, when the kids gather, and we ask them, “Where shall we go today?” For in Forest School style, we only move as a group if every single child comes to a consensus on which place to go to. This is because no matter how long they take, or how pleased or not they are with their eventual decision, the biggest takeaway is that they themselves each agreed to the decision. And so they have to stand by it, and they will. On some days, we thank our lucky stars that all of them decide quickly and set off in merriment with much joy and have more than enough time to fully enjoy their journey and agreed-upon destination. But all too often, especially for the regular and long-time kids, they fall into severe disagreement over where to go. For some sessions, we have up to 14 children. Imagine all 14 of them disagreeing vehemently with one another, and you’ll see why getting consensus on this topic could be harder than decisions to be made in Parliament. As the children slowly get to know one another, they start to figure out various ways to come to a consensus. Usually, the ‘analytical leaders’ take charge and start to go around to the dissenters to persuade them to change their minds. Start from the easy-going ones, get a majority, then move on to the hard nuts. In a normal school setting, teachers would not have even allowed kids to dawdle and take their time to decide. 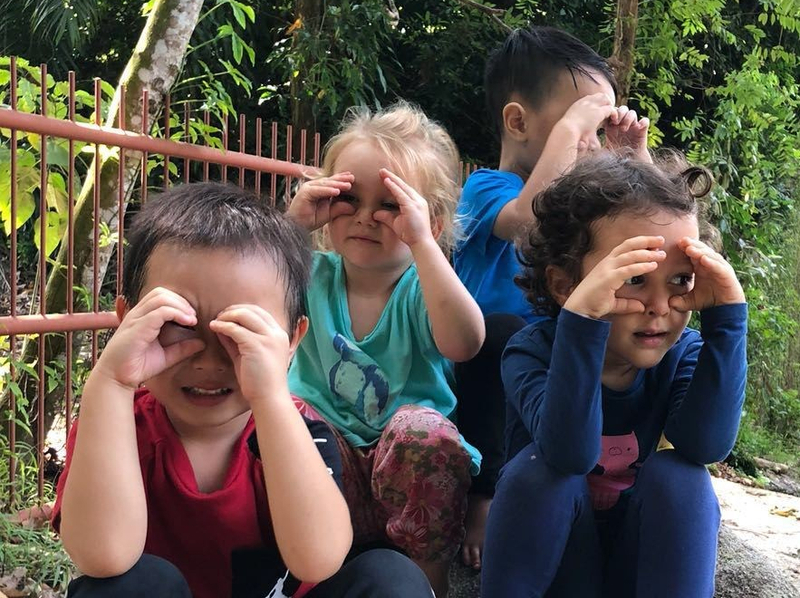 In Forest School, coaches can offer suggestions when suitable, but such emotional outbursts provide a natural opportunity for everyone to learn to understand and respond. It’s social learning in the most genuine of situations, with real tears and angst. What do we do? How do we decide? Shall we compromise? What do you need to happen next time? And the toughest question to work through would be on how they feel, as kids are less adept at regulating their emotions independently. In so doing, they hope to nurture the kids’ empathy towards others. So when kids cry, when they release their emotions, we won’t rush to comfort them or overly swaddle them. We let their friends respond to them, help them, and in so doing, the kids themselves learn to soothe themselves and one another, and grow much more emotionally resilient. This happens in Forest Schools everywhere. A most inspiring example is that of Maruntabo, The Forest Kindergarten in western Japan. On a most chilly and rainy winter day, the young kids are so tired that they can barely zip up their backpacks, let alone to walk all the way back. They start to cry… and the teacher simply walks alongside them, with a watchful eye, but allowing them the space to manage their emotions. This video is a must-watch!